Nearly seven weeks into her first pregnancy, Joan Bremer faced a mother-to-be’s worst fear — she had a miscarriage. While the 31-year-old recovered, she was inspired to get a tattoo to commemorate the experience. “For me, all the tattoos I have signify something, and even though this was a painful time, I still wanted to be able to remember it in some way,” Bremer told TODAY Parents. 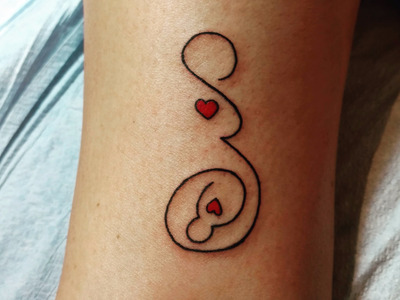 Just days after her miscarriage, she was inked with a simple yet meaningful design. It features a single line joining two hearts, symbolizing the connection between mother and child. Bremer shared a photo of her memorial tattoo on Imgur to express her grief and support those who faced the same heartbreak. The post quickly went viral as hundreds of women offered condolences and shared their own experiences with pregnancy loss. Bremer has plans to add to her ink in the future.